Colloid Mill Machine Manufacturer In India.. We are one of the pioneer “Colloid Mill Machine” Manufacturers from India, “Colloid Mill Machine” is used for Particle size reduction in the liquid department to reduce from coarse to fine particle size, Colloid Mill is based on Rotor and stator principle, as you decrease the gap between Rotor and Stator you can get fine product.Colloid Mill Machine is a machine used in the disintegration of solid particles or droplet size of a liquid present in suspension or emulsion. The Colloid Mill Machine consists an inlet (which is subjected to a tremendous shearing action that effects a time dispersion of uniform size) and an outlet. Colloid mill works on the rotor-stator principle. 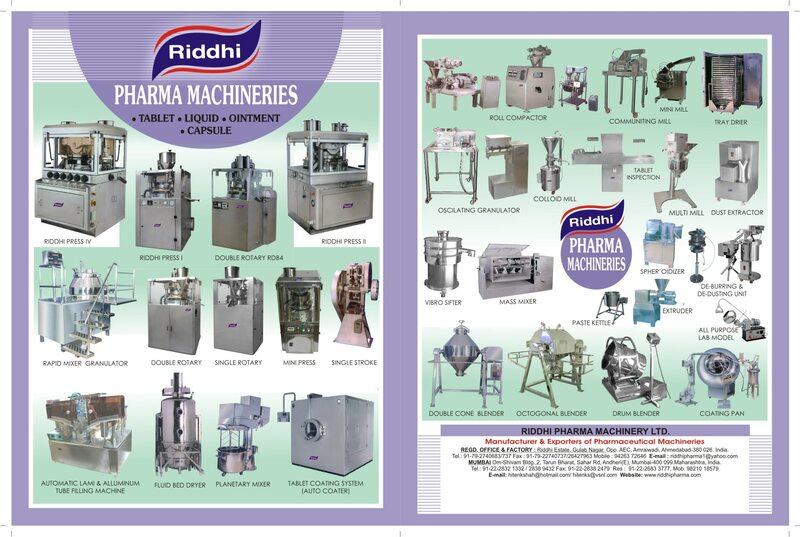 Technical Offer Of Colloid Mill Machine: RIDDHI Colloid Mill is suitable for Homogenising, Emulsifying, Dispersing, Mixing, Comminuting of liquids to highly viscous products. It is based on rotor- stator principle. It is available in plain as well as Water Jacketed model which is suitable for heat sensitive products. Flame proof electrical can be supplied on demand at extra cost. .
Colloid Mill Machine Manufacturer In India. We are one of the pioneer “Colloid Mill Machine” Manufacturers from India, “Colloid Mill Machine” is used for Particle size reduction in the liquid department to reduce from coarse to fine particle size, Colloid Mill is based on Rotor and stator principle, as you decrease the gap between Rotor and Stator you can get fine product.Colloid Mill Machine is a machine used in the disintegration of solid particles or droplet size of a liquid present in suspension or emulsion. The Colloid Mill Machine consists an inlet (which is subjected to a tremendous shearing action that effects a time dispersion of uniform size) and an outlet. Colloid mill works on the rotor-stator principle. Colloid Mill Machine Manufacturer In India., We are one of the pioneer “Colloid Mill Machine” Manufacturers from India, “Colloid Mill Machine” is used for Particle size reduction in the liquid department to reduce from coarse to fine particle size, Colloid Mill is based on Rotor and stator principle, as you decrease the gap between Rotor and Stator you can get fine product.Colloid Mill Machine is a machine used in the disintegration of solid particles or droplet size of a liquid present in suspension or emulsion. The Colloid Mill Machine consists an inlet (which is subjected to a tremendous shearing action that effects a time dispersion of uniform size) and an outlet. Colloid mill works on the rotor-stator principle. GREASE COLLOID MILL SUPPLIER IN INDIA: We are the largest making “Grease Colloid Mill” Supplier from India.We are one of the reckoned entities in this domain, indulged in manufacturing and exporting Grease Colloid Mill. These Grease Colloid Mill are designed using premium quality of raw materials that are sourced from the authentic vendors of the market. Our offered Grease Colloid Mill machines are available for the customers with temperature control jacket with inlet & outlet coupling. These Grease Colloid Mill equipments are available for the customer in different specifications at economical prices. Our Grease Colloid Mill are quality tested and then provided at the customers' place within the stipulated time frame. GREASE COLLOID MILL MANUFACTURER IN INDIA: We are the largest making “Grease Colloid Mill” Manufacturer from India.We are one of the reckoned entities in this domain, indulged in manufacturing and exporting Grease Colloid Mill. These Grease Colloid Mill are designed using premium quality of raw materials that are sourced from the authentic vendors of the market. Our offered Grease Colloid Mill machines are available for the customers with temperature control jacket with inlet & outlet coupling. These Grease Colloid Mill equipments are available for the customer in different specifications at economical prices. Our Grease Colloid Mill are quality tested and then provided at the customers' place within the stipulated time frame. GREASE COLLOID MILL SUPPLIER IN INDIA. We are the largest making “Grease Colloid Mill” Supplier from India.We are one of the reckoned entities in this domain, indulged in manufacturing and exporting Grease Colloid Mill. These Grease Colloid Mill are designed using premium quality of raw materials that are sourced from the authentic vendors of the market. Our offered Grease Colloid Mill machines are available for the customers with temperature control jacket with inlet & outlet coupling. These Grease Colloid Mill equipments are available for the customer in different specifications at economical prices. Our Grease Colloid Mill are quality tested and then provided at the customers' place within the stipulated time frame.